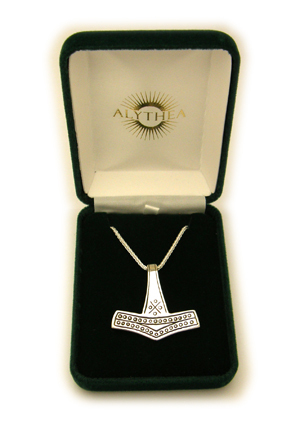 “Then he gave the hammer to Thor, and said that Thor might smite as hard as he desired, whatsoever might be before him, and the hammer would not fail; and if he threw it at anything, it would never miss, and never fly so far as not to return to his hand; and if be desired, he might keep it in his sark, it was so small; but indeed it was a flaw in the hammer that the fore-haft was somewhat short.” — The Prose Edda, translated by Arthur Gilchrist Brodeur (1916). 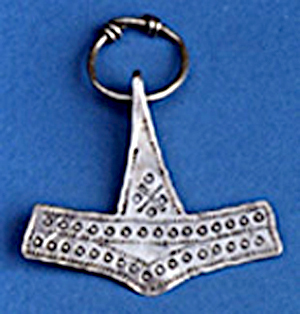 This is a replica of a,small silver pendant discovered near Rømersdal, Bornholm, Denmark originating from the 9-11th century AD. The original is now in the Danish National Museum. The pendant is solid, thick, no soldered ring for a chain, the chain goes right through the forged hoop on the rear. 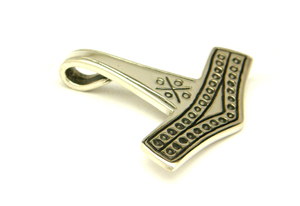 Loki the trickster God had this hammer made in the Dwarfish underworld as a gift for Thor in reparation for some previously mischevious actions. 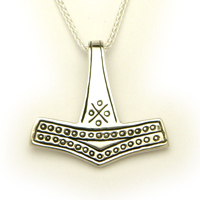 Mjölnir is usually translated to "lightning" or "thunderbolt", Thor being the Thunder God, when you hear thunder and see lightning, this is his hammer in action - crashing to the ground and coming back to rest in his hand. 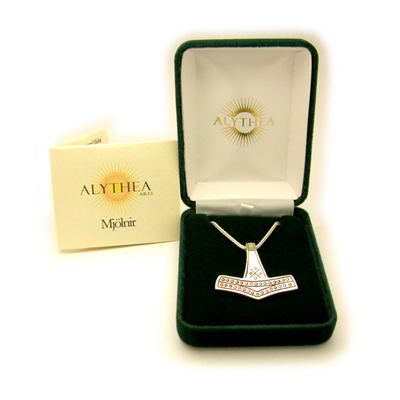 This pendant is solid silver, hallmarked and smooth on the rear, weighing about 14 grams and is 1 1/2" wide and tall. The pendant includes our 18" Spiga/Wheat rope chain. Also available in Gold alloys by request.